Forest City was originally known as Burnt Chimney in the late 1800’s. Today, the southern charm, bustling Main Street and iconic water fountain, draws visitors from near and far to experience a historic community thriving in modern times. The lively downtown features trendy boutiques, nostalgic antiques and a plethora of dining options. 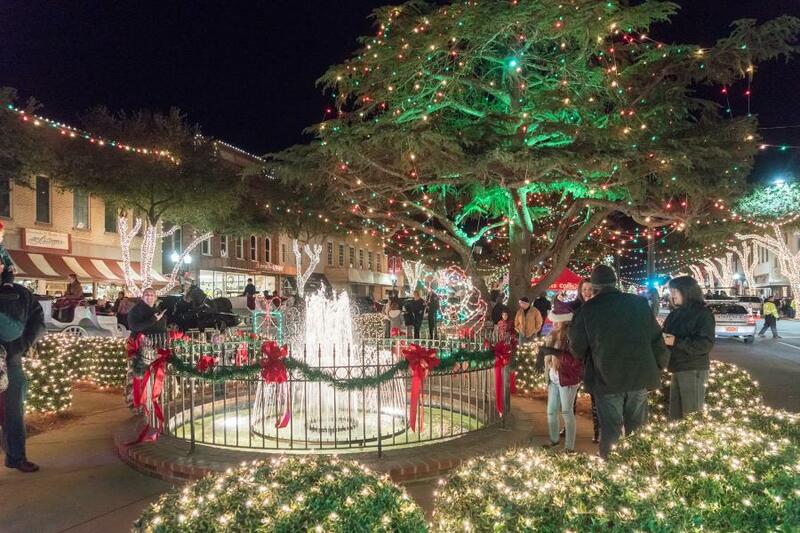 Popular for its wonderland of lights during Christmas and classics like vintage cars and wooden-bat baseball, this small town with deep roots is your gateway to true southern hospitality. 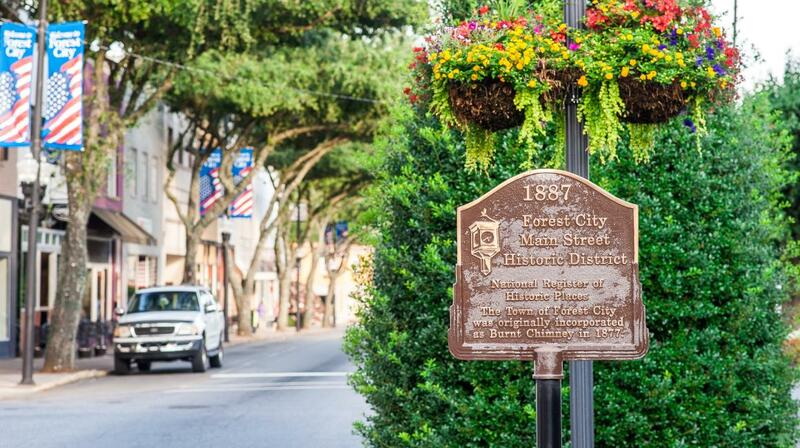 You’ll find plenty to do on your day trip to Downtown Forest City, a town that shines in any season. Start your journey in the early morning to grab a sweet treat from Davis Donut House. A local staple within the community for over 45 years, their traditional glazed doughnuts and acclaimed orange twists are usually sold out by 9AM. Stop in or drive through to try one of your favorites, and grab a cup of Joe as you head into town. Next, visit a museum filled with iconic automobiles, each telling a story of childhood memories. 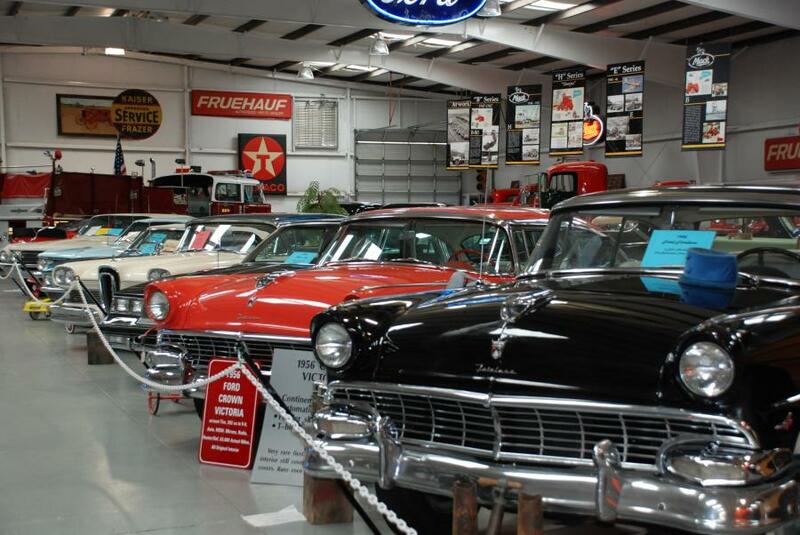 From unrestored originals like Model T’s and Mack Trucks to the Ford Mayberry and retired Fire Trucks, Bennett Classics Car Museum is a showroom of over 70 vehicles from generations past. Car enthusiasts will cruise back in time viewing antique classics and vintage equipment, reliving decades of change in design and speed. Bringing people in from all over the globe, the museum hosts many car clubs throughout the year, making this a great place to meet or have a retreat. Rutherford County’s Farm Museum is considered a goldmine to the past. Be entertained by displays of artifacts throughout five rooms reflecting life in agriculture and textiles from the late 18th and early 19th centuries. You’ll be awed by the beauty of painted murals depicting the cycle of cotton production and textiles from around our county. Enjoy memories from your youth or learn first hand how much farming has changed overtime. Arrive in downtown and become acquainted with your surroundings while relaxing on one of the benches in the center of town at the Main Street Fountain. Soak in the beauty of the live oak trees and historic buildings, and listen for the illuminated town clock to chime on the hour. As you take a look around, you’ll notice a variety of restaurants, if you haven’t smelled them already. There are plenty of locally owned restaurants to choose from serving a variety of menu selections to please everyone’s mood. 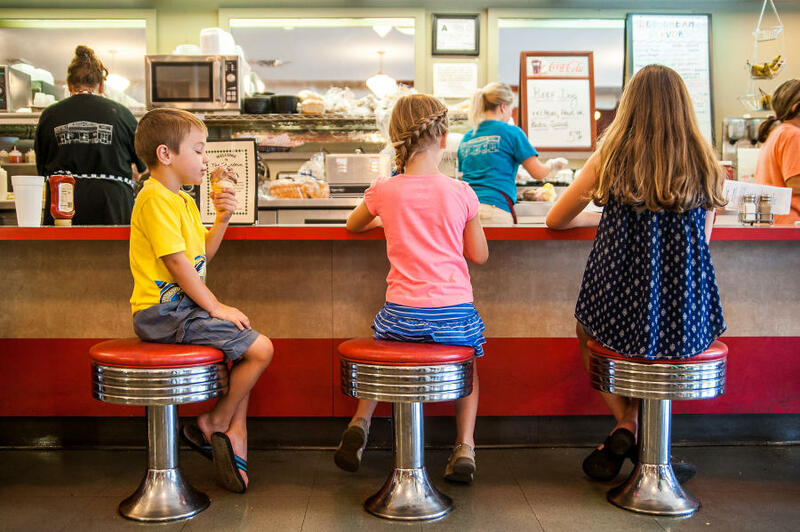 Walk back in time to the nostalgic setting of an old-fashion soda fountain and take a seat at the lunch counter inside The Fountain at Smith’s Drugs. Sip on some sweet tea and flip through the menu to find salads, wraps and famous sandwiches like the Pimento cheese, a sweet and tangy combination of warm and gooey goodness. If you want to experience the items they are most known for, order from the grille and don’t forget a side of waffle fries! In the mood for traditional southern soul food, smoked with homemade sauce? Try Moe’s Original BBQ, serving award-winning pulled pork, ribs, wings, turkey and chicken smoked over hardwood served with two unique sauces in a relaxed atmosphere. Around the corner is Louie’s Café, serving up traditional NY style pizza. Fill up your afternoon strolling the street and checking out the trendy boutiques, antiques and unique works of art. 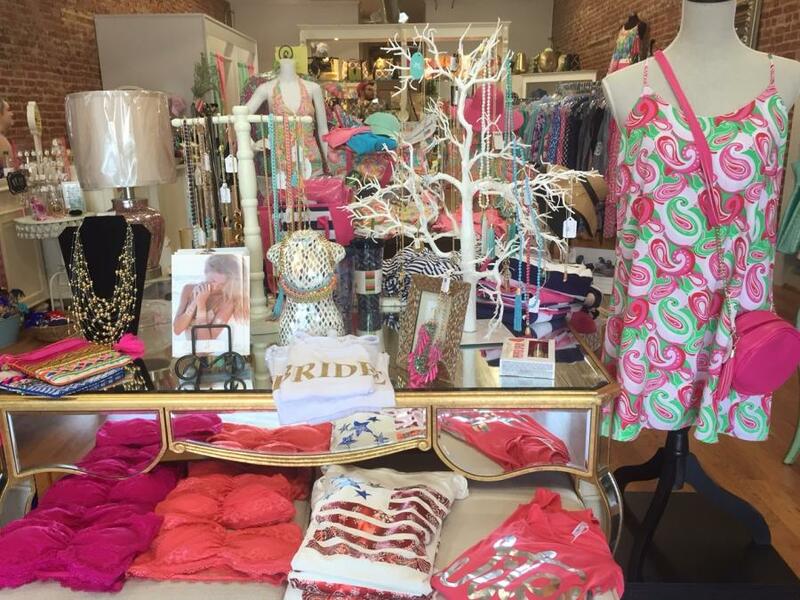 With new arrivals rotating often, stay in style with fashionable clothing at Mirror Mirror Boutique. Find the latest apparel for any season and the accessories to match, plus home décor, baby and children’s attire and cute gifts. Across the street is Farmer’s Hardware, a downtown fixture for over 100 years. Once a store housing bolts and tools, has long since been adapted to a gift shop offering one-of-a-kind items to visitors from all over including crafts, garden items, Christmas décor, novelty and souvenir gifts. Just a few store fronts down you’ll find Dovetails and Rusty Nails, a family owned and operated antique and collectibles shop showcasing a large selection of glass art, pottery, furniture and vintage clocks. Revisit your childhood past looking at cars, baseball cards and toys. If you’re an adventure seeker living an active lifestyle, stop in at Puzzle Creek and browse through their outdoor attire, gear, equipment, and bikes. You may want to plan a trip back to take part in one of their various events happening throughout the year. Grab a snack for fuel during your shopping excursion at Popcorn Plus. Popping up over 100 flavor combinations of gourmet popcorn, you can satisfy your sweet and salty cravings in bags, baskets or tins. Also try their home baked treats and Hershey&apos;s Ice Cream. Discover an ancient technique to creating clay pottery. 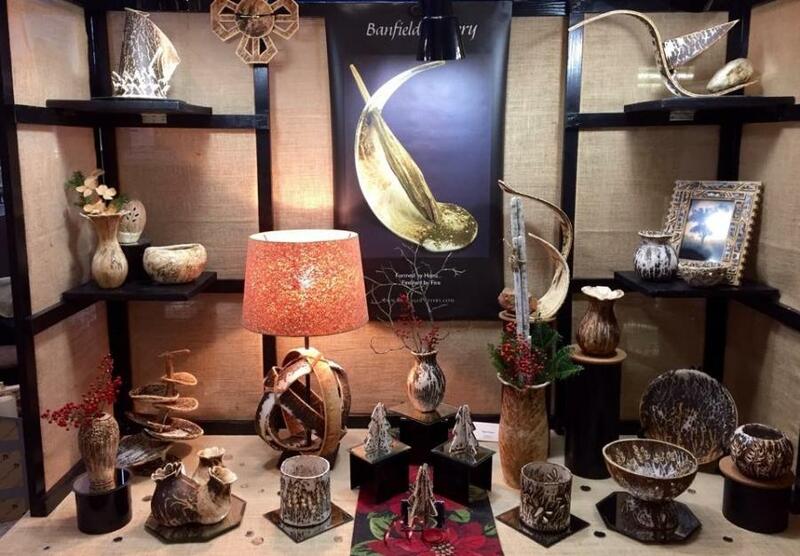 Banfield Gallery, located just one block away, is filled with traditional and contemporary designs that brings fresh and innovative styles in Obvara and Sawdust firing, producing a variety of colors, textures and patterns to pottery. Meet the friendly owners and tour a one-of-a-kind gallery to find creative vases, lamps, candle holders, frames, and much more! Set to open in 2018 is a newly developed outdoor space that was once home to a longstanding historic mill. Forest City’s Florence Mill was built in the late 1800s and remained open for almost 110 years before closing in 2001. After sitting unchanged for the past seventeen years, the location has been revamped into a park with a large amphitheater designed to seat more than 1,000 people, a multi-use splash pad and many other outdoor activities. Completing in the fall of 2018 is the Thermal Belt Rail Trail, a 12-foot wide paved path connecting communities across Rutherford County including Forest City, Spindale, Rutherfordton, Ruth and Gilkey. The 13.5-mile trail will provide recreational activities for fitness and exercise, pet-friendly and offer amenities at various access points through each of the towns. After a long day of shopping, it’s time for dinner at one of the many eclectic eateries. 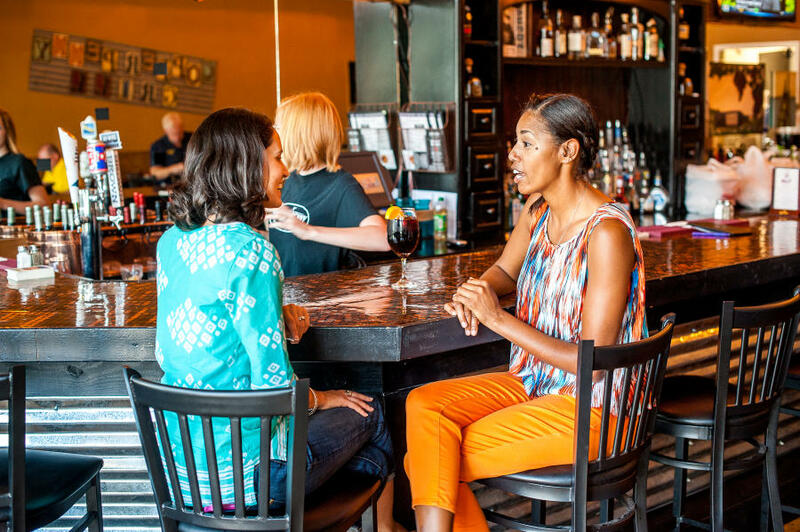 Copper Penny is a locally owned and operated restaurant featuring a lounge with a penny designed glass bar. Start with one of the distinctive appetizers such as the Tachos and Ahi Tuna. For your entrée choose from grilled salmon, fish tacos, homemade pasta and famous steaks and burgers. If Mexican and a lively environment is calling your name, then enjoy the evening at El Michoacán. Featuring a full bar and authentic cuisine, you can fill up on all of the traditional items from nachos and quesadillas to burritos and enchiladas. After dinner head over to Twisted Pear. Enjoy one another’s company while playing trivia or listening to regional live music. Check out over 20 locally craft beers and ciders on tap or try one of the regional house wines. The taproom carries over 200 different varieties of bottle selections inside their shop for you to pick out and pop open inside or take to go. Be entertained with other activities in Forest City including baseball games, rounds of golf at and special events. 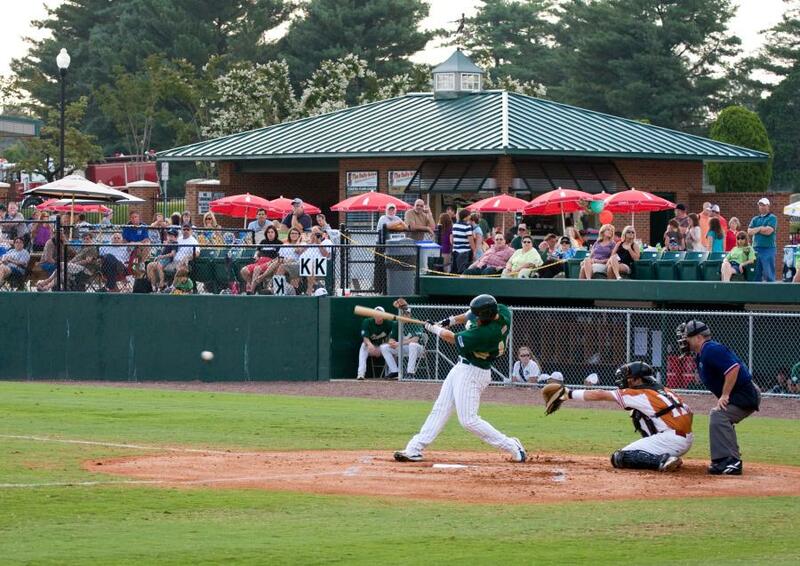 If you are visiting between the months of May – August, you can catch a baseball game at McNair Field. A member of the Coastal Plain League, the Forest City Owls is a collegiate summer wooden-bat baseball league featuring top notched college players from throughout the nation. Games are played inside their hometown turf, named after the Houston Texans football team owner Robert McNair. Relive an American past-time enjoying stadium amenities like hot dogs from the concession stand, beer and soda, plus all the action inside the grandstand. During summer nights, come back to dance at outdoor concerts and celebrate the fourth of July with a large fireworks display. Each August, the main street turns into a hot spot for car enthusiasts. At Hot Nights, Cool Rides, Forest City hosts an automobile festival that lines 400+ vehicles along the streets from antique Model T’s and classic Mustangs to custom built hot rods and decked out motorcycles. Boasting live entertainment, fun activities and plenty of food vendors, don’t miss this high-energy annual event known as the largest car show east of the Mississippi. During the Christmas season, bring the whole family to Forest City’s Hometown Holiday’s Festival. Under a canopy of over one million lights enjoy horse drawn carriage rides, ice skating, hot chocolate and carol singers, and of course, visits with Santa.